Canadian rocker Bryan Adams signed for A&M Records in 1978 and his first single, 'Let Me Take You Dancing' came out the following year and was a minor hit in his home country. His self-titled debut album came out in 1980 and by the time of 'Into The Fire', his 1987 album, Adams had released four other albums including 'You Want It You Got It' in 1981 and 'Cuts Like a Knife' in 1983. 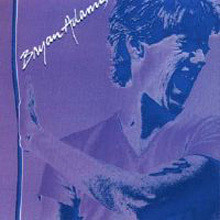 The latter album includes the single 'Straight From The Heart' that became Bryan's first US top 10 record. It wasn't until 1985 that Adams made his break through in Britain and Europe when the classic, radio friendly, anthem, 'Run To You' made No.11 in the UK and was a hit in a number of other countries. In the US it made No.6, however, that success was eclipsed later in the year when 'Heaven' topped the US charts; somewhat surprisingly it did less well in Britain and elsewhere. All this action helped take 'Reckless', the album from which both 'Run To You' and 'Heaven', along with a string of other singles, including the 'Summer of '69', to No.1 in America and top 10 in a host of charts around the world. While 'Into The Fire' performed less well in America, reaching No.7, it was a big hit in many countries in Europe. All this was just a prelude to what followed when 'Waking Up the Neighbours', Adams's 1991 album, went to No.1 in the US, UK, Canada, Australia, Germany and a string of countries worldwide. It included the record-breaking '(Everything I Do) I Do It for You' that became his second No.1 hit single in Billboard Hot 100. The song in the movie Robin Hood: Prince of Thieves and topped the charts in numerous countries around the world including France, Australia and Germany and the UK where it spent an astonishing 16 consecutive weeks at number 1 on the UK Singles Chart Bryan's albums continue to mine a rich vein with their well crafted, well performed, songs that resonate with fans around the world. Born in Kingston, Ontario, to British parents who had emigrated from England in the 1950s., Adams' father joined the Canadian Army, followed by a stint with the United Nations as a peace keeping observer, and finally as a Canadian diplomat. Adams grew up traveling around the world with his parents, with his father's diplomatic postings in Europe and the Middle East. He traveled through the United Kingdom, and the Middle East, and spent more than four years in Lisbon, Portugal and a year in Vienna, Austria. From the ages of 14 to 18, Adams worked as a dish washer to save money for a proper guitar. He quit the job after a year and started auditioning as a guitarist while rehearsing his own band in his mother's rented basement in North Vancouver. Adams elected to sing until they found a singer, but they never found one, and his auditioning landed him a few jobs, with bands like Shock and Sweeney Todd, who in 1976 released If Wishes Were Horses with the 15-year-old Adams as the singer. He quit school to play nightclubs and go on the road and upon his return he settled into the Vancouver studio scene, working as a background vocalist for the CBC and working with keyboardist Robbie King, whom Adams attributes as having given him his first paying session. In 1978, at the age of 18, Adams met Jim Vallance introduced by a mutual friend in a Vancouver music store. Vallance was the former drummer and principal songwriter for Vancouver based rock band Prism and had recently quit that band to focus on a career as a studio musician and songwriter. They agreed to meet at Vallance's home studio a few days later, which proved to be the beginning of a partnership which still exists today. Later in 1978, Adams signed to A&M records for the paltry sum of one dollar. Some of the first demos written in 1978 have surfaced over the years, most notably "I'm Ready" (recorded for both the album Cuts Like a Knife and later his release for MTV Unplugged) and "Remember," which was recorded on his first album. Both songs were covered by other artists even before his first album was released. Also recorded during this time was "Let Me Take You Dancing," which made the Canadian RPM chart in March 1979 and its B-Side "Don't Turn Me Away". "Straight From The Heart" was also written during this period. The song was later recorded for Adams' third album "Cuts Like A Knife" in 1983 and released as a single, becoming Adams's first top ten record in the US in 1983. Adams' self-titled debut album was released in February 1980, and marked the beginning of what was to become a long songwriting partnership between Adams and co-writer Jim Vallance. With the exception of "Remember" and "Wastin' Time", most of the album was recorded from 29 October up until 29 November 1979 at Manta Studios in Toronto and co-produced by Adams and Vallance. The album was certified gold in Canada in 1986. Adams' second album, You Want It You Got It, was recorded in New York City in two weeks and it marked Adams' first album co-produced by Bob Clearmountain. It was released in 1981 and contained the FM radio hit "Lonely Nights," but it was not until his third album that he achieved international recognition, popularity and sales. Adams also co-wrote songs for other bands during this time including Billboard charted songs like "No Way to Treat a Lady" for Bonnie Raitt, Don't Let Him Know for Prism, Teacher Teacher for 38 Special, Edge Of A Dream for Joe Cocker and many more. Cuts Like A Knife, which was released in January 1983, was Adams' breakout album due mainly to the lead singles. "Straight from the Heart" was the most successful song, reaching number ten on the Billboard Hot 100. Another single, "Cuts Like a Knife" charted at number 15. "This Time" also placed on the Hot 100. Music videos were released for four of the singles from the album. "Cuts Like a Knife" arguably became Adams' most recognizable and popular song from the album. Its music video received heavy airplay on music television channels. The album peaked at number eight on the Billboard 200 album chart and achieved three times platinum status in Canada, platinum in the United States and gold in Australia. Adams's album, Reckless, co-produced by Adams and Bob Clearmountain, peaked at number one on the Billboard 200. The album was released in November 1984 and featured the singles, "Run to You", "Summer of '69", "Heaven", "One Night Love Affair", "Somebody", and "It's Only Love", a duet with Tina Turner. All the singles had accompanying music videos and all charted on the Billboard Hot 100 but only "Run to You", "Summer of '69", and "Heaven" peaked in the top ten. "Heaven" became the most successful single from Reckless at the time of its release on the pop charts, reaching number one on the Billboard Hot 100 and number nine on the mainstream rock chart. "It's Only Love" was nominated for a Grammy Award for Best Rock Vocal Performance by a Duo or Group. In 1986, the song won an MTV award for Best Stage Performance. After the release of the album, Adams was nominated for Best Male Rock Performance. The album is Adams' best-selling album in the United States and was certified five times platinum. After the tour in the United States, Adams took part of a grand ensemble of Canadian artists named Northern Lights, who recorded the song "Tears Are Not Enough" for the African famine relief effort. Adams later headed back to Europe for a fifty city concert tour with rock singer Tina Turner culminating in April with his return to London to headline three sold-out shows at the Hammersmith Odeon. Adams began the first leg of his tour entitled "World Wide in '85" which started in Oklahoma and ended in October 1985. Adams later visited Vancouver, Canada, and afterward returned to the American East Coast to play 2 sold-out concerts in New York. In 1989 Adams did backup singing on Motley Crue's album Dr. Feelgood and also on Belinda Carlisle's song "Whatever It Takes" which appeared on her Album Runaway Horses. Adams' next album, Waking Up the Neighbours, co-produced by Adams and Mutt Lange, peaked at number six on the Billboard 200. It was even more successful on the other side of the Atlantic, reaching number 1 on both big European markets, the UK and Germany. The album was released in September 1991 and featured "(Everything I Do) I Do It for You", his second #1 hit single in the Billboard Hot 100. This song was featured on the album and a movie Robin Hood: Prince of Thieves, starring Kevin Costner and Alan Rickman. The single topped the charts in numerous countries around the world including big markets such as the US, the UK, France, Australia and Germany. "(Everything I Do) I Do It For You" spent 16 consecutive weeks at number 1 on the UK Singles Chart, breaking a record previously held by Slim Whitman with Rose Marie since 1955. It also achieved record-breaking sales in the US. Canadian content regulations were revised in 1991 to allow radio stations to credit airplay of this album towards their legal requirements to play Canadian music. Adams won a Grammy Award in 1991 for Best Song Written Specifically for a Motion Picture or for Television. The tour continued through several European countries in June 1992, including Italy, Germany, Holland and Scandinavia, and in July 1992, Bryan performed for the first time in Hungary and Turkey (where he filmed his video for "Do I Have To Say The Words?"). During the long tour, further singles from the Waking Up the Neighbours album were released: In the US, the rocky "Can't Stop This Thing We Started" peaked at number 2, and "Do I Have to Say the Words?" reached number 11. In the UK, "Thought I Died and Gone to Heaven" was the most successful single behind "(Everything I Do) I Do it for You" by reaching the Top 10. In September through December 1993, the tour took place in the US. The Asian tour headed to Thailand, Singapore, Japan, and Hong Kong in February 1993, before returning to the US during March through May. Adams last studio effort which has been certified by the RIAA. 18 til I Die was certified three times platinum in Canada and Australia and two times platinum in the UK. On 27 July Adams performed at the Wembley Stadium in London in front of a crowd of about 70,000. It was his second sold-out concert there and it is often considered as his biggest concert ever as it went out live to 25 countries and fans from all over the world came up to watch the performance.It also received rave reviews from critics and fans alike. In December 1997, Adams released MTV Unplugged with three new tracks: "Back to You", "A Little Love" and "When You Love Someone". "Back to You" was the first single, followed by "I'm Ready", an acoustic version of the Cut's Like A Knife track. The album was a top 10 success in Germany while both singles reached the top 20 in the UK. On a Day Like Today was released in 1998 and was the first studio album since 1981's You Want It You Got It which wasn't certified by the RIAA. This release coincided with his contract being sold to Interscope Records. Despite Interscope's involvement or lack of, On a Day Like Today enjoyed tremendous success internationally, entering the Top 5 in Germany and was certified platinum in the UK. It generated two British Top 10 singles: "Cloud Number Nine" and "When You're Gone", a duet with Melanie C of the Spice Girls. To commemorate the millennium, Adams released The Best of Me, his most comprehensive collection of songs at that time, which also included two new songs, the title track "The Best of Me" and the UK number 1 track "Don't Give Up". The album reached the Top 10 in Germany and was certified three times platinum in Canada and Platinum in the UK. The single from the album, "The Best of Me" was a very successful hit with the exception of the US, where neither the single or the album were released by Interscope Records. In 2000, Adams wrote and sang on a song for Chicane's album Behind the Sun called "Don't Give Up". Even though his voice is somewhat altered electronically, it is still recognisable. An official music video was made of the song, in which Adams also appears. In 2002, Adams wrote and performed the songs for the DreamWorks animated film, Spirit: Stallion of the Cimarron. The songs were included on the film's soundtrack. The most successful single from the soundtrack was "Here I Am", a British Top 5 and German Top 20 hit. The song also gave him his fourth Golden Globe Award nomination for Best Song from a Motion Picture. Adams released his eleventh album internationally on 17 March 2008. It was appropriately called 11. The album was released in the US exclusively at Wal-Mart and Sam's Club retail stores on 13 May 2008. The first single released from the album was "I Thought I'd Seen Everything". Adams did an 11-day, 11-country European acoustic promotional tour to kick off the release of the album. The album debuted at number one in Canada (making it his first album to reach that position since Waking Up the Neighbours in 1991) as well as reaching number two in Germany. In the United States, the album charted at number 80. 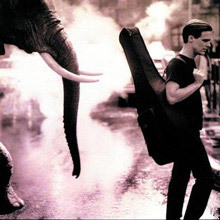 In May 2009, Bryan Adams announced on his Twitter account that he has started writing and recording a new album in Paris. 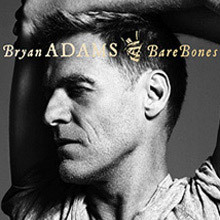 In November 2010, Adams released the acoustic album Bare Bones. It was recorded live at various locations on his "Bare Bones Tour" earlier in the year. It was certified gold in India a year later, and he thanked all his Indian fans for giving him such support. 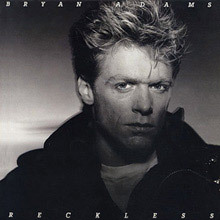 Reckless is the fourth studio album by the Canadian rock artist Bryan Adams. Co-produced by Adams and Bob Clearmountain, it was one of Adams' most successful albums. Released on November 5, 1984 through A&M Records, the album was a huge international hit, selling over 5 million units in the United States alone. It was the first Canadian album to sell more than one million units within Canada. The album peaked at number 1 on the Billboard 200 and reached high positions in charts worldwide. The album has sold more than 12 million copies worldwide. Six singles were released from the album: "Run to You," "Somebody," "Heaven," "Summer of '69," "One Night Love Affair," and "It's Only Love." All six singles made the top 15 on the US Billboard Hot 100, a feat that at the time had been accomplished previously only by Michael Jackson's Thriller. The album was ranked No. 49 on Kerrang! 's "100 Greatest Heavy Metal Albums Of All Time" and was named the #12 Greatest Canadian Album of All Time by Bob Mersereau in his book The Top 100 Canadian Albums. The album was recorded at Little Mountain Sound Studios, Vancouver, Canada. On December 12, 2009 the syndicated radio program In the Studio celebrated the 25th Anniversary of the album. 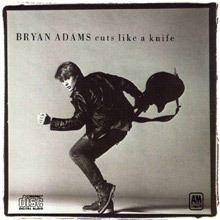 Cuts Like a Knife is the third studio album by the Canadian rock artist Bryan Adams. Released on 18 January 1983 through A&M Records, the album became a huge commercial success in Canada and the United States whereas outside North America, the album did poorly. After the release of Reckless the album would chart on the British album chart and would later be certified Silver by the BPI. It was recorded at Little Mountain Sound, Vancouver, Canada. The album was a commercial success and sold over 2 million copies worldwide. Three singles were released from the album: "Straight from the Heart", "Cuts Like a Knife" and "This Time"; the three were responsible for launching Adams into mainstream popularity. The album is regarded as one of Adams' finest albums and of the greatest albums of the 80's. The album was named the #48 Greatest Canadian Album of All Time by Bob Mersereau in his book The Top 100 Canadian Albums. 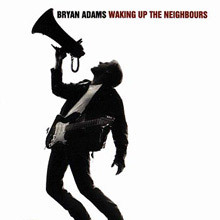 Waking Up the Neighbours is an album by Canadian singer/songwriter Bryan Adams released in 1991 and his sixth studio album. The album was recorded at Battery Studios in London, and at The Warehouse Studio in Vancouver, mixed at Mayfair Studios in London, and mastered by Bob Ludwig at Masterdisk in New York City. "(Everything I Do) I Do It for You" was number one on the British charts for a record-breaking sixteen weeks. The album sold more than 10 million copies worldwide. 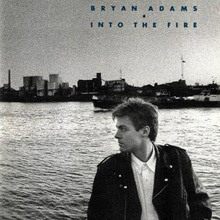 Into the Fire is the fifth studio album by the Canadian rock artist Bryan Adams. Released on March 30, 1987 through A&M Records, the album was a commercial success, albeit somewhat of a disappointment following the huge success of 1984's Reckless. Into the Fire sold over 2 million units worldwide, peaking at number 7 on the US Billboard 200 chart and reaching high positions in charts worldwide. The album was recorded at Adams' home in Vancouver, Canada. 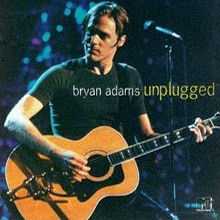 Unplugged is an acoustic live album by Canadian musician Bryan Adams. The album was recorded completely on September 26, 1997 at the Hammerstein Ballroom in New York City. Adams was joined by Irish piper Davy Spillane and Michael Kamen who wrote orchestrations for many of the songs and brought students from the Juilliard School to play them. Three new songs were included; "Back To You", "When You Love Someone", and "A Little Love". The song "If Ya Wanna Be Bad - Ya Gotta Be Good" makes its debut on an album, originally appearing on the B-side of "Let's Make a Night to Remember" - to which it is paired on the Unplugged album. Absent from both the CD and DVD is "Hey Elvis", which is available on the single of "Back To You". A second single was released in early 1998, an acoustic reworking of the hardrock song "I'm Ready". On a Day Like Today was released in 1998 and Bryan recruited producer Bob Rock for this album. The album reached No.11 in the UK and the title track was the first single released from the album and reached No.13 in the UK. ‘When You're Gone’, the second single, features Spice girl, Melanie C. and it reached No.3 in Britain. Cloud Number Nine made No.6 in the UK. 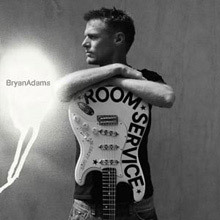 Room Service is the ninth studio album by Canadian singer-songwriter Bryan Adams. The album was released by Polydor Records on September 10, 2004. Room Service was the first release of new Adams material since the soundtrack album Spirit: Stallion of the Cimarron in 2002 and the first studio album in six years since On a Day Like Today. Adams produced the album and co-wrote the album with Gretchen Peters, Nicholas Bracegirdle, Phil Thornalley, Robert John "Mutt" Lange, Eliot Kennedy and Jürgen Elofsson. Similar to Adams previous material, the themes in Room Service are mainly based on romance, love and relationships. Room Service was a commercial success, peaking at number one in Germany and Switzerland, despite mixed reviews from critics. The album charted in the top ten in seven other territories; its least successful charting area was France, where the album peaked at number two-hundred. Room Service entered the charts in more than 15 countries. The album didn't fare as well in the United States, where it was released by Adams without a record company, but internationally the album sold 3 million copies. 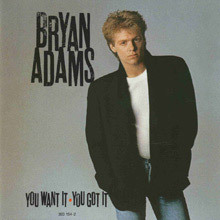 You Want It, You Got It is Bryan Adams' second solo album, and was released in 1981. This was the album that established the sound that Adams has retained throughout his recording career. Unlike the debut album where Adams and Vallance played most of the instruments themselves, You Want It You Got It was recorded live in the studio. It was recorded and mixed in NYC over a two-week period during the spring of 1981. The album was originally to be titled "Bryan Adams Hasn't Heard Of You Either" (due to critics' indifference to his first album and singles) but Adams's sense of humour didn't make it past the gate keepers at the record company, who opted for the safer title.